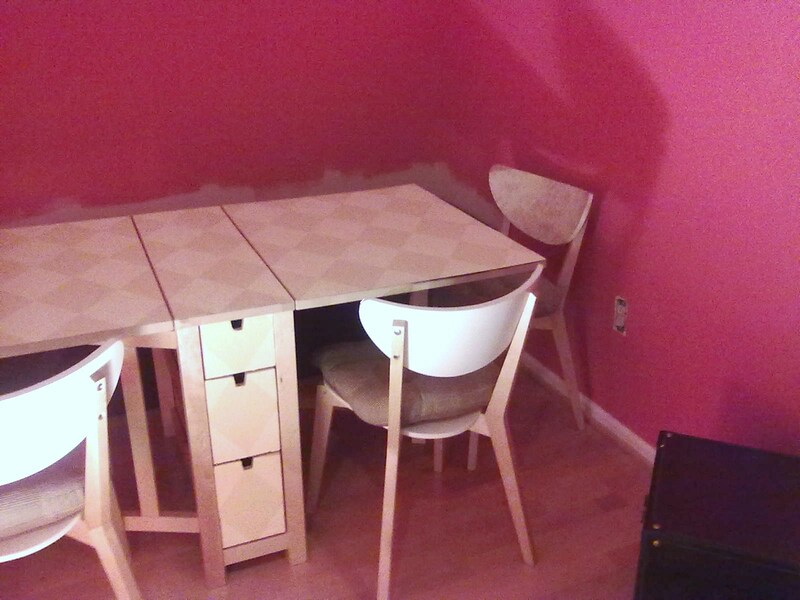 While writing the last post, I couldn’t believe I hadn’t posted the dining room with all its updates yet. 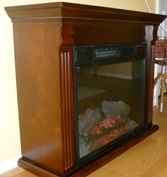 My corbels haven’t arrived yet and I’m still sifting through old photos for the right and left walls. 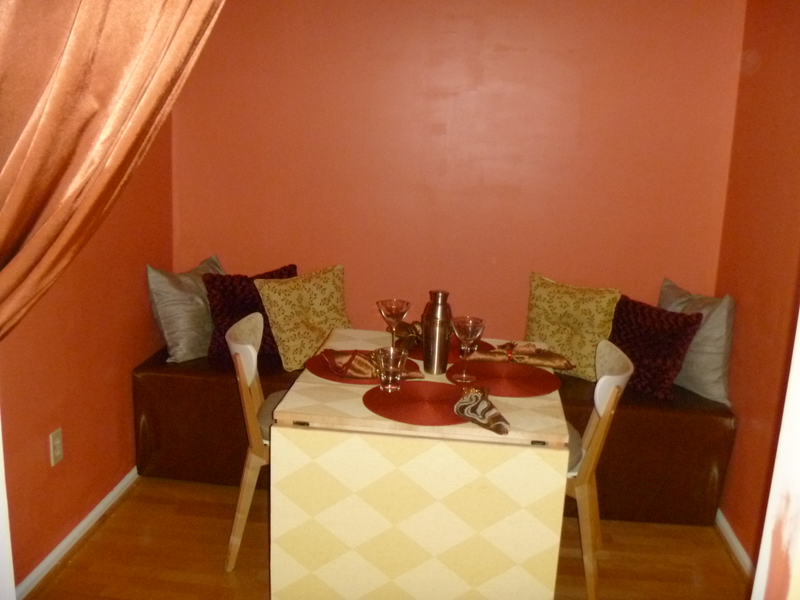 As such, the walls are still bare, but look at what a difference table dressings and accent pillows make! I experimented with drapes over the entrance, both in my head and dining room. I got funny looks when I told people my idea, and therefore second, third, even fourth-guessed myself. But I stuck with my gut and headed over to Boscov’s (the only affordable drapery!). My 9 foot ceilings require 9 foot drapes that will be seen from both sides. Luckily, I came across 18 foot scarves ($20) that I considered hanging as you would a scarf over a window. But my attempts to get it stay wrapped failed and the scarf pretty much fell over the rod like this, with 9 feet on each side. This look is 2 different scarves, 1 in bronze-ish red, and 1 in gold. I planned on leaving it only to 1 side like this as to not overwhelm the room. But I love it so much I am going to repeat the look on the other side. I will also install metal drawbacks instead of the current tasseled string so that it doesn’t taper quite as much toward the bottom. I’ve complained about the price of pillows before, so I usually buy anything that are priced reasonably and fall into the right color scheme (which is hard to come by). The floral one is actually a seat cushion that I cut the tie strings off of. They were $1 at Walmart! I wish I had use for more of them! 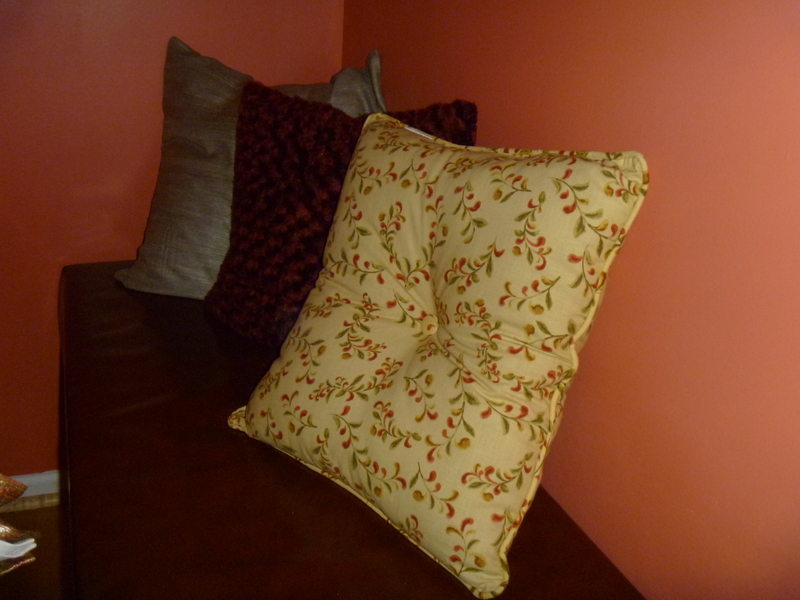 The rosy textured pillows came in a pair for $12 from Home Goods. The taupe pillow that doesn’t photograph well is from Ikea and was sold as just the pillow case, $7. The pillow form was sold seperately for $2. I’m always shopping for more pillows but I’m happy with the progress so far. The red place mats are also from Walmart, $4 for the set. I went a little fancy on the napkins after receiving a promotional email from Pier 1. I’m a big believer in individuality. I use wine markers even if there are only 2 of us and 1 of us is drinking from a margarita glass. 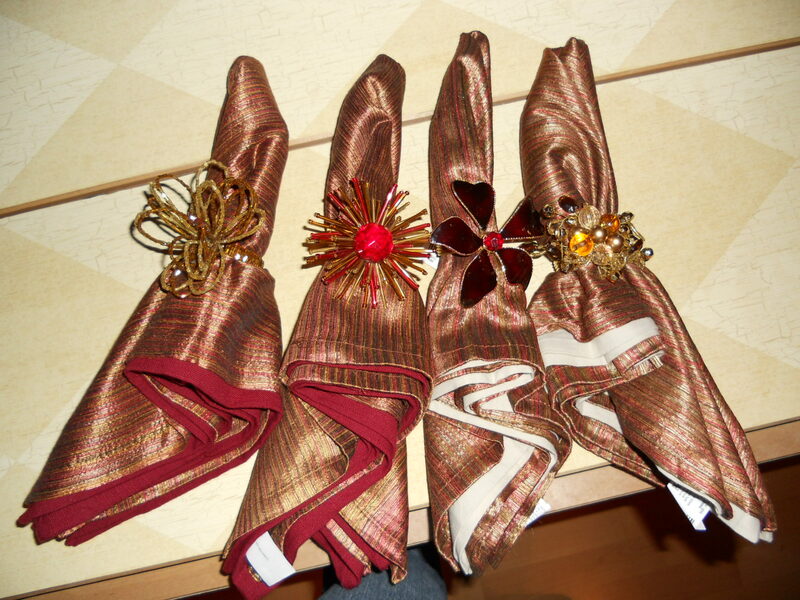 So of course I’m going to let everyone get their own special napkin ring! The room is undoubtably premature for dinner parties. 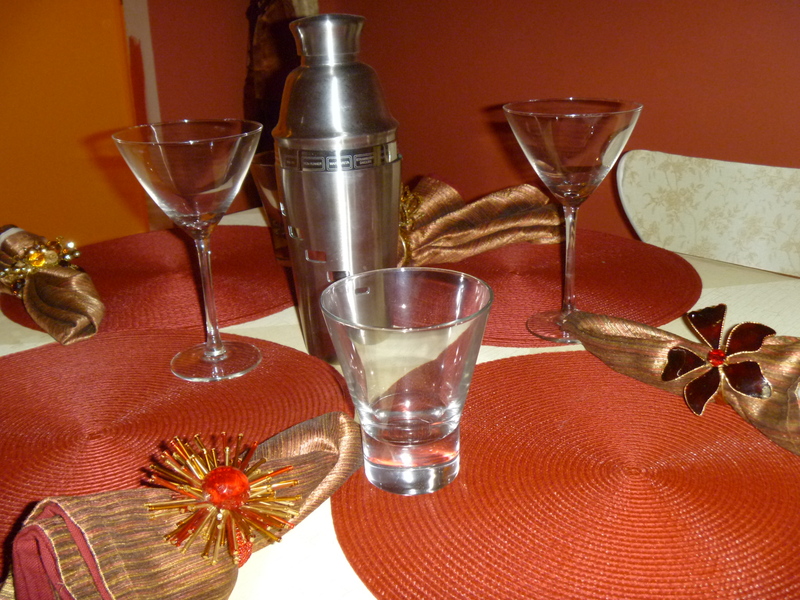 The table is deserving of a pretty centerpiece other than this top of the line martini shaker. But for now, it’s nice to look at on my way out the door. After reading your article, i have some issues in understanding the second paragraph of the passage . Because i’m extremely interested in what you’ve written, so can you explain that for me? Otherwise, your blog is seriously pretty fantastic . Thank you! Everything should be made as simple as possible … but not simpler.